The Armada Polyester Sling Backpack - 13" x 16.25"
This backpack has a zippered main compartment, fully padded back and laptop compartment! Zippered front pocket with organizer panel. 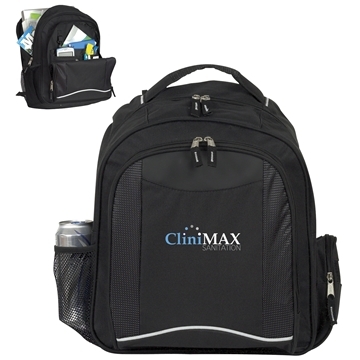 Zippered multi-media pocket, mesh water bottle pocket and laptop compartment. Fully padded back and padded adjustable shoulder straps. was exactly as described and ordered. This was the 2nd time I ordered these. They showed up each day sooner than expected. Great customer service, quick response time, fantastic product, exactly as described. they are GREAT and EXACTLY WHAT WE WANTED!! These products really are a large hit at our obligation festivals.